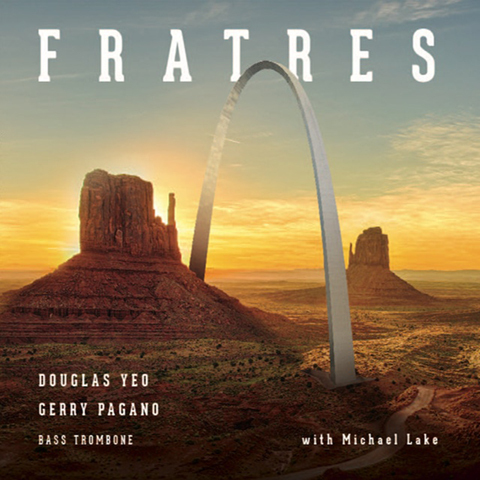 Born from a initial meeting many years ago at Tanglewood between Doug Yeo and Gerry Pagano, this CD is the result of two bass trombonists who through the years have also become good friends. The CD after all, is titled Fratres, which is latin for Brothers. Gerry and Michael Lake also go back several years from their time together at Arizona State University. The two recorded a jazz CD that that rose on the jazz top-40 charts for many weeks and gained critical acclaim. Doug and Gerry recorded a wide variety of music for this CD that spans nearly 600 years. Bartok, Bach, Tommy Pederson, Bill Reichenbach, Michael Lake and more are represented on this unique expression of two good friends playing some bass trombone duets. Wow. Amazing and what a great sound you get. Very enjoyable – arrangements, everything..
Lake and Pagano deserve a lot of credit for what they’ve accomplished here. Roads Less Traveled is an inspired, well-wrought work of art. Beautifully played and wonderful to have something so fresh. Keep them coming! A superb new CD with exquisite playing, great arrangements and FUN written all over it.